Postmortem specimen showing advanced bilharzial involvement of the urinary tract. Note the dirty bladder mucosa, fibrosed muscle layer, and neo-plastic growth (histo-logically a squamous cell carcinoma) cut through transversely. The ureters are dilated, with a clear stricture at the lower end of the right ureter. Also seen in this patient are bilateral hydroureters with submucous cystic lesions (bilharzial ureteritis cystica). 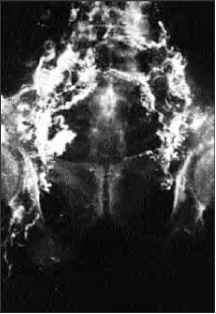 The kidneys show considerable scarring, with the right kidney also showing chronic back pressure changes.